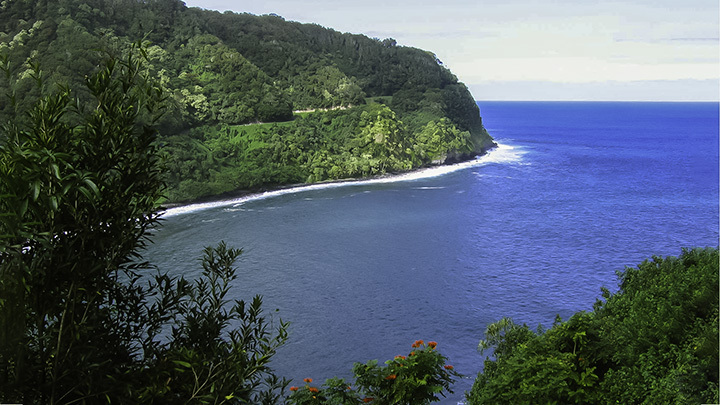 The iconic road to Hana is perhaps one of the most popular attractions on the Hawaiian island of Maui. And there is only one highway that take you there. 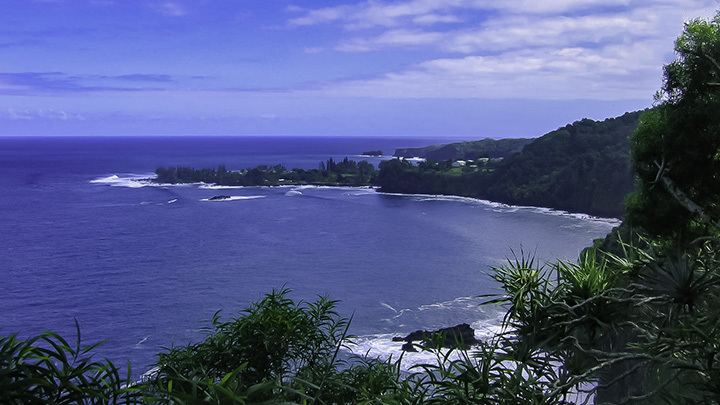 Originally built as road for sugar plantation workers, the Hana Highway extends 64 miles. The highway is famous for its nearly 620 curves, and 60-plus bridges. Tourists traveling from Pa’ia to Hana can expect to take about 2.5 hours without stops. But for those who want to enjoy it, the journey can easily extend into an all day trip. Besides the lush rainforests and elaborate bridges, the waterfalls are undoubtedly some of the best sites along the road. Twin Falls, near mile marker 2, looks like paradise and has a beautiful pool where visitors can swim. After mile marker 19, the Upper Waikani Falls or Three Bears Falls rushes down like a bridal veil. Hanawai Falls is dreamy waterfall near a bridge near mile marker 24. 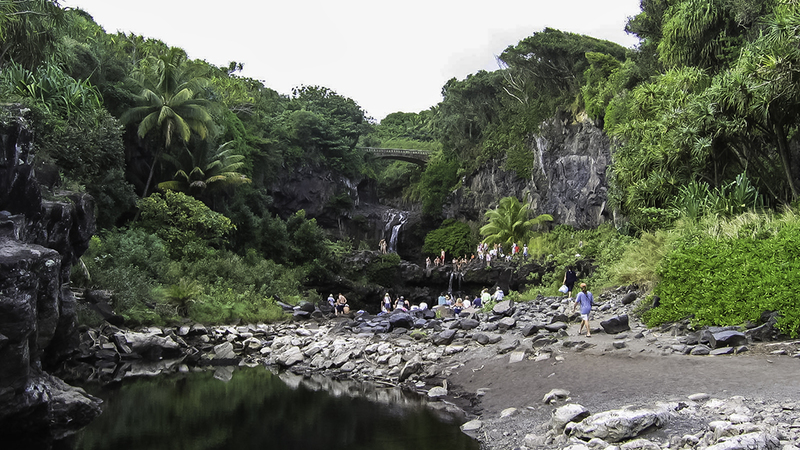 Many consider Wailua Falls, between mile markers 44 and 45, as the picture perfect waterfall. As the majority of the road winds along the coast, there are several beaches that are worth visiting. Koki Beach, while not suitable for swimming, features a colorful mix of white, black and red sand. Hamoa Beach, near Hana is ideal for family swimming and is renowned for being one of America’s best beaches. Wai’anapanapa State Park, also near Hana, is home to the black-sand Honokalani Beach. The unique Kaihalulu Beach in the town of Hana features red sands. Visitors should exercise caution as the hike to this beach can be both treacherous and challenging. As such, it is not a safe place to swim. There are also wayside parks, inlets, coves, heiaus and small resting places to discover along the way. Be sure to take every opportunity you can to soak in the environment as the road to Hana is an exceptional experience both visually and culturally. Roadside view from the Hana Highway. Many of the picnic places on the way by waterfalls or lookouts will give you the perfect opportunity to take a break or to explore along some nearby paths. We recommend you drop into to a general store in Hana or Pai’a to buy your lunch. There are not many places to get a meal on the road. Enjoy some of the fresh banana bread at a road-side hut or try the best bread at the store called Halfway to Hana. This is a favorite delicacy along the Hana Highway and is worth every penny. Add some mood music to the ultimate road trip, and buy a CD of sweet Hawaiian melodies that includes a ukulele or slack keyed guitar. Or accompany your drive by playing an informative CD about Hana that will discuss historical elements and cultural details about the famous road as you are traveling. If you want to enjoy the sites of the road as long as you can, prioritize splitting the trip into a few days, and stay somewhere on the way. But if you are camping, be aware you may risk a downpour as this tends to be an area of heavy rainfall. If you decide to camp at the Kipahulu Campground in Haleakala National Park, you will be very near the Seven Sacred Pools in Oheo Gulch. Many regard this area as Hawaii’s most mysterious series of waterfalls. Oheo Gulch and the Seven Sacred Pools area. For those traveling to Hawaii in peak season, be sure to leave for Hana early, since the road can get backed up. Also, be sure you make the return journey a few hours before dark. The winding roads can be dangerous to drive at night; so plan your Hana Highway adventure accordingly and drive slowly. Whipping around those turns will not only make you nauseous, but will put you and your fellow travelers in jeopardy. Remember this adventure is not about just arriving at Hana, but is about the memories you make along the way. Stop often, explore waterfalls and roadside sights, try coconut milk or tropical treats at a roadside stand and don’t forget to dip your toes in the ocean. Enjoy the ride.